When illness or an accident occur, it's reassuring to know that here in San Felipe we can get the help we need any hour of the day. Dr. Marquez and his caring, well-trained staff are there for us. Located adjacent to the police station, it's a bright, clean facility where we can find immediate medical assistance. My experience there was such a positive one, with such a happy ending, that I want to share it with my friends here who have not yet needed the hospital's help. At nine o'clock on a quiet Saturday night, I developed extreme chest and abdominal pain. I had been scheduled for gall bladder removal in Mexicali the following week, but the severity of the pain told me there wasn't time to wait any longer. I couldn't think of a worse time to go; emergency care on a Saturday night, labs closed, minimal staffing, waiting my turn on a hard chair in the lobby. I couldn't have been more wrong. The doctor on duty that night admitted me immediately, called a colleague in to assist, and began administering pain-killers through an IV. The laboratory was opened up and my blood work-up and urinalysis came back quickly. As the pain subsided, so did my fear. I spent the night there, on a clean and comfortable bed, with my husband Dan sitting by my side. Dan spent almost thirty years as a paramedic and knows more than most about emergency care and protocol. He confirmed what I felt - that the hospital staff couldn't have done a better job. The following morning, as we drove to Mexicali for surgery, I was grateful for their professionalism and kindness. 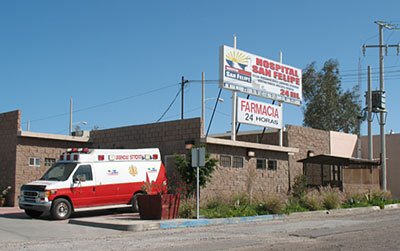 San Felipe Hospital is thought of as a first responder for emergency care and trauma, but it provides comprehensive care to our community as well. Dr. Rangel, a primary care physician, and Dr. Becerra, a gynecologist, offer a wide range of services including wellness exams and pap smears. The radiological technician, Juan Ramone, is there for mammograms and x-ray needs. A valuable asset to our community, the San Felipe hospital stands ready to help us, with trained staff and a comfortable and comforting facility.